View our photo gallery. It holds over 3,400 photos, maps and plans that have been grouped by source into more than 300 albums. The gallery is maintained on Picasa, which currently only allows album searching using the 10 most used tags. To view photos from a particular building, therefore, we would advise using Fotofeed on the appropriate page of this site. Try our mobile Android app. 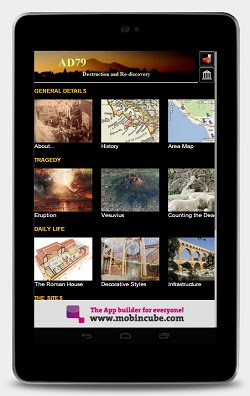 The app covers general details of the eruption and provides a detailed description of all properties to be seen in Herculaneum, Stabiae, Boscoreale and Oplontis. Books that may be of interest for further reading. Chance of eruption: very low. The excavations at Pompeii are located just west of present day Pompei, while Herculaneum is situated in the modern town of Ercolano. Both these sites have excellent connections by road and rail with Naples, Sorrento and neighbouring towns. The other sites discussed here, including those at Stabiae, Oplontis and Boscoreale are all within easy reach. Their location can be found by use of the map below. Smaller settlements such as Murecine (Moregine) and Terzigno can be found by visiting the Neighbouring Area page. As a glance at the map shows, Vesuvius looms large over all these towns and settlements. This site uses Google Maps extensively. You can use your mouse or the directional arrows to move about the map and the '+' and '-' buttons to zoom in and out. For a full description of the features available, or to create your own maps, use this link. There are various ways to find a particular property. You can look for it using the search facility at the top of the page or the Navigation Bar on the left. To view a list of the properties in a particular town select the town from the map here or from the Navigation Bar. This will then display a brief history of the town and list the properties featured there. For Pompeii and Herculaneum, however, because their histories are rather longer, the property list is on the sub page, Map of Pompeii or Map of Herculaneum together with a detailed map. Different browsers may have issues with some of the site's features, such as Slide Show and Video. If you are unable to see the slide shows, please check you have the latest version of Flash installed. The site occasionally has an optional link to an external 3D image. If you wish to view these images, you will require to have Quicktime loaded on your computer. All the above utilities are available free from the sidebar. This is a non-commercial site. We would like to thank all the authors of original material used in the site and trust that we have acted fully in accordance with the various licenses applying to their material. The maps in the Pompeii section of this site are generally based on the GIS provided by Pompeiana.org and MainstreetGIS. Images not attributed to any particular author lie, to the best of our knowledge, in the public domain. If this is not the case, please advise us and we will either remove the offending image or comply with its license conditions. The details of photographs used in individual pages may be found by clicking on the Fotofeed link at the bottom left of all pages containing such material. This site is simply intended to give an overall view of the effects and aftermath of the Vesuvian eruption, a virtual guide book, if you like, for the Campanian towns that were destroyed that day in late summer AD79. The information on the site has been cross checked with as many sources as possible and none of the text relies on a single source. The written sources of the data are listed in the bibliography, but this has been extensively added to by on-line resources. The plans and maps have all been produced by the author and are based on actual surveys, those in Pompeii on the excellent GIS provided by MainstreetGIS. As mentioned above, the photographs come from a multitude of sources, all of which are referenced in the photo library together with their associated copyright restrictions. We hope you will enjoy the site. For comments, feedback or suggestions for the site, please use the form on the Contact Us page. General tidying up including restoring external links which had been broken or corrupted. 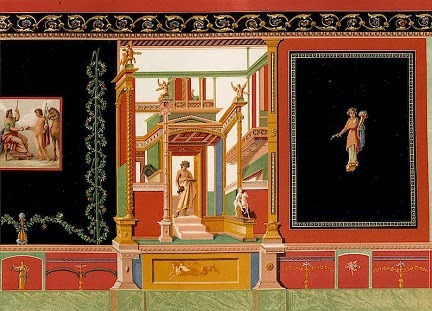 A 3D visualisation of the Villa of the Papyri, Herculaneum is in the pipeline based on the plan by Karl Weber as modified by A. De Simone in his paper "Rediscovering the Villa of the Papyri". Several pages updated to comply with browser security in displaying data from external sites including Google Maps, Google View, Timeline and Amazon. 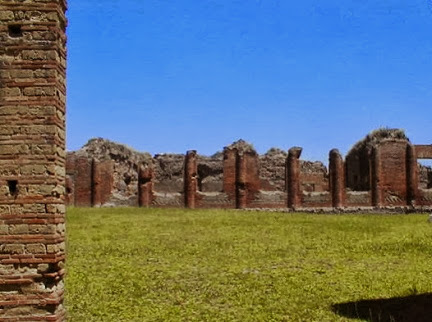 Added the page featuring the Sarno Baths, Pompeii with a plan, photographs and walkthrough. Updated the page of the Central Baths, Pompeii with some new pictures and additional text.